So near, yet so far. One of the headline targets of the Millennium Development Goals (MDGs) to halve the proportion of undernourished people in the world between 1990 and 2015 was almost met. The distance travelled in this respect, represented by the swathe of green in the picture below, is a staggering achievement. I have written here before about some of the very real improvements brought about in Brazil through concerted political action to tackle hunger; an experience which is now informing global development policy in this area. That said, before submitting to the seductive proposition that ‘the problem of food’ can be solved in the next fifteen years, something which the new Sustainable Development Goals (SDGs) holds out with their target to end hunger by 2030, the record of the last fifteen years must first be subject to some sober analysis. Most obviously, there has been significant variation in performance. Like many other MDG success stories, the reduction in world hunger owes much to China, which accounted for almost two thirds of the decrease in the number of undernourished people in ‘developing regions’ as a whole. In sub-Saharan Africa, by contrast, the number of undernourished people counted has increased by 44 million. Perhaps more tellingly, there remains a marked geographical divide within countries. It is thought that about three quarters of the world’s hungry live in rural areas, often working in farming and fishing. What this unevenness suggests is that the policies which supported food consumption for the world’s urban working classes during the last two decades are unlikely to assist the displaced, the unemployed, the extreme poor, the isolated and the ill in the same way (indeed, they could be contributing to the very production of these vulnerabilities). In other words, feeding the estimated 795 million people who still do not have enough to eat is a qualitatively different challenge. There has also been controversy about the way hunger is counted. Towards the end of the MDG period the official provider of food statistics, the UN Food and Agricultural Organisation (FAO), announced that it had changed its calculation. Overnight, instead of the number of undernourished people in the world having increased by 82 million between 1990 and 2010, it was now said to have decreased by 142 million! Beyond this narrow methodological debate, a broader set of questions have asked whether ‘the prevalence of undernourishment’ is such a useful indictor for measuring hunger. This is because: (a) it only considers calories and so discounts other nutritional requirements, such as protein and vitamins; (b) the calorie intake benchmark is based on people having a sedentary existence rather than active and energy-demanding lives; and (c) it is averaged over the whole country and whole year, thereby ignoring the effects of localised and temporary food shortages. Indeed, even the FAO admits this indicator produces a ‘conservative estimate’ of hunger. Finally, the ‘food problem’ is not simply one of ending hunger. On the one hand, while the industrialisation of food production may have helped feed affluent global consumers, it has also developed its own pathologies. Among them are agrarian displacement, mass deforestation, water stress and pollution, and the gross inefficiency of using edible grains as animal feed. On the other hand, the over-consumption of food has become as worrying as under-consumption. To give just one example, because of changes in diets, particularly increased sugar consumption, diabetes has spread throughout the world and now subjects an estimated 8% of the population to increased risks of kidney disease, amputation and blindness. How different the development landscape looks from this perspective! © Copyright Sasi Group (University of Sheffield) and Mark Newman (University of Michigan). Published under Creative Commons licence. While the limits and failings of the MDGs are rarely discussed in public, least of all amid the relentless aspirationalism of the assembled dignitaries at the launch of the SDGs, behind the scenes they have informed the work of international development bureaucrats. Many of the points noted above were captured in the SDG brief written by the Technical Support Team for Food Security and Nutrition, staffed by specialised UN agencies. For instance, it stressed that rural poverty reduction strategies remained critical, but should also be supplemented by ‘nutrition-sensitive’ social policies, such as free school meals and support for breastfeeding mothers. In turn, these arguments shaped the final text of the SDGs, although not without some compromise along the way. A comparison with the 2014 draft version reveals that the reference to obesity was dropped from Goal 2.2 to end malnutrition, and that the prospective goals to curb excessive food price volatility and reduce food waste were shunted into lower profile parts of the SDG plan. More positively, language about the secure and equal access to natural resources was inserted into Goal 2.3 to double the productivity and incomes of small-scale food producers. So, notwithstanding these compromises and some problematic continuities with the MDGs, chiefly a state-centred model of development mapping and accountability, the SDGs do contain some important changes. But what are the most significant of these, and what might they mean for the UK? The ultimate wording of Goal 2 was this: ‘End hunger, achieve food security and improved nutrition, and promote sustainable agriculture’. While the call to end hunger is obviously the most eye-catching aspect, it is, as we have seen, not the most useful measure of meaningful progress. It’s also worth recalling that such calls have been made before, undermining the claim that this represents a uniquely ambitious statement. ‘Within a decade, no child will go to bed hungry; no family will fear for its next day’s bread’, declared the US Secretary of State at the World Food Conference in 1974. For me, the most significant aspects of the SDGs lie elsewhere. 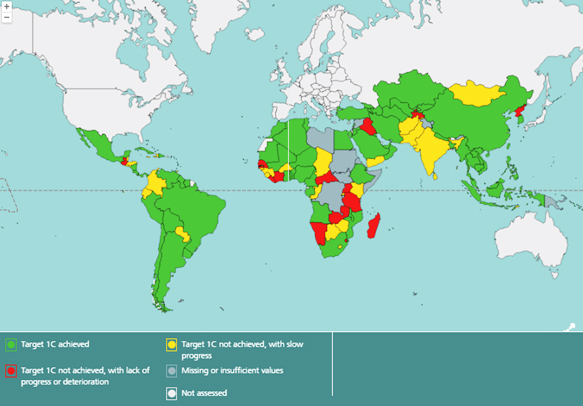 First, alongside the existing ‘prevalence of undernourishment’ indicator, there is a new indicator being proposed to measure hunger (the indicators for the targets will not be finalised until March 2016). This is the Food Insecurity Experience Scale and it uses psychometric questionnaires to identify the existence of temporary food shortages, the quality of food eaten and the levels of anxiety felt at the household level. As such, this better captures the effects of market volatility, gender inequality and social crises on people’s diets. Given greater prominence in development thinking by virtue of its inclusion in the SDGs, this indicator could thus assist an alternative food politics. It is more likely to provide data favourable to those groups calling for changes in distribution, rather than greater investment in Green Revolution technologies (typically promoted by multinational agribusiness and privileged in the existing measurement system). It is also more likely to evidence instances of severe food insecurity in countries where hunger is not considered to be a problem, like the UK. Second, there is a stronger focus on nutrition, especially in young children. Put simply, this has the advantage of shifting attention from how much people eat to what they eat and when. It also makes it easier for development planners to channel money to mothers, who are seen as necessary conduits for early years’ interventions, although by the same token it risks reifying women’s status as the primary caregivers. There are other dangers besides, like pursuing a technical fix to malnutrition through breeding vitamin- and mineral-enhanced crops. The UK’s Department for International Development (DFID) seems particularly attracted to this idea. It has made commitments of £655m to the Global Nutrition for Growth Compact (strapline: ‘Beating Hunger through Business and Science’) and funded agronomic projects under this banner. However, as noted by the Independent Commission for Aid Impact (ICAI), this research has not translated well into real-world farming, nor sufficiently met the needs of poorer, women farmers in Africa and Asia. This resonated with its subsequent finding that DFID’s engagement with business more generally has not turned ‘high-level ambitions into detailed operational plans clearly focused on poverty reduction’; DFID’s support for the New Alliance for Food Security and Nutrition is given as a prime example. Third, the most radical aspect of the intellectual transition between the two development agendas is surely the fact that the SDGs will be applied to every country in the world, not just the ‘developing regions’ as happened in the MDGs. To this end, the United Nations Development Programme (UNDP) commissioned a study to see which goals would be most appropriate for ‘developed regions’ to prioritise. One of them was the goal around sustainable consumption that now includes a target to halve food waste. This would pose a thorny problem for the UK government, which in 2013 flatly rejected the recommendation by the International Development Committee on Global Food Security to introduce mandatory targets on domestic businesses, despite them wasting an estimated £6 billion of food in the country per year. Other targets like improving the incomes of small-scale food producers would be no less challenging for the UK government to achieve. Consider the recent decision by the Department of Environment, Food and Rural Affairs to scrap Common Agricultural Payments to 16,000 farms of less than five hectares. . At present then, and as outlined by David Cameron’s speech to the UN, it seems that Western leaders still believe that the SDGs are not really meant for them.